Some Democrats (such as Bill Curry) have realized for a long time that Hillary Clinton had serious problems as a candidate. While this should have been obvious since at least 2008, it appears that some are just catching on now, with The Hill running a story entitled Clinton’s dismal approval ratings prompt Dem fears. 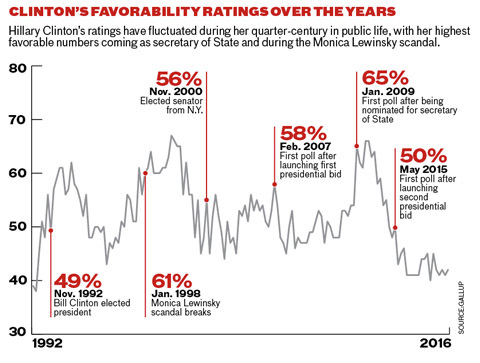 Hillary Clinton’s favorability ratings are historically low and increasingly a concern for her supporters. The historic comparisons are stark. At this point in the 2008 presidential cycle, then-Sen. Barack Obama (D-Ill.) was seen favorably by 62 percent of voters and unfavorably by just 33 percent. Even in February 2012, the closest comparable point in his re-election campaign, he had a net positive favorability rating in the Gallup poll of 2 percentage points, compared to Clinton’s current net rating of minus 11. In March 2000, then-Texas Gov. George W. Bush (R) was viewed favorably by 63 percent of respondents in the Gallup poll and unfavorably by 32 percent. But independent observers note that, while a general election is by its nature comparative, the capacity of each candidate to inspire supporters and thus drive turnout can also be crucial. This did not keep Clinton from continuing to lie about Sanders’ gun record while campaigning in New York. Among her many lies is to attack Sanders with claims that guns from Vermont are a major source of gun violence in New York. This distortion is based upon playing games with the numbers based upon the population of Vermont. The Washington Post Fact Checker gave her Three Pinocchios for this lie. Factcheck.org and PolitiFact also criticized her for her distortion with selected statistics, especially as guns from Vermont represent less than two percent of guns recovered and traced in New York. Clinton looks further dishonest when attacking Sanders on guns should voters recall that in 2008 Clinton ran as a self-described pro-gun chruchgoer. This only reinforces the fact that Clinton will say anything go get elected. As The Washington Post pointed out, Clinton gambles that people will not pay attention to the fact checkers. There certainly are a number of partisan Democrats who will overlook all her lies, but the majority of independent voters, along with many Democrats, realize that if Hillary Clinton’s lips are moving, she is probably lying. So, yes, if some Democratic strategists are now starting to become fearful that many voters will not turn out to vote Democratic if Hillary Clinton is the nominee, they are right.